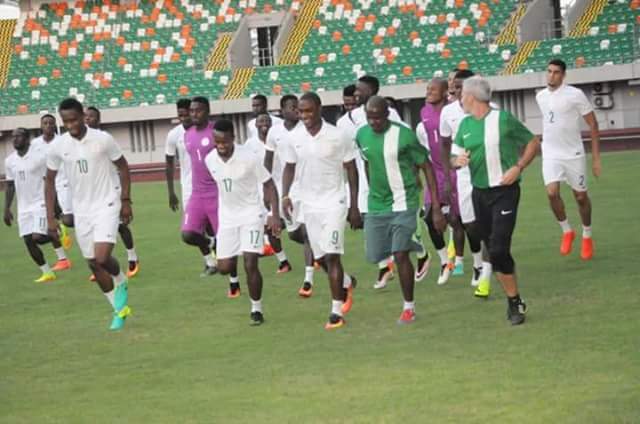 Nigeria’s Super Eagles returned to the country on Friday afternoon after spending a week training and playing friendly matches against Corsica and Togo. Seven players and some back-room staff arrived in Abuja from Paris after yesterday’s 3-0 win over the Hawks . The other players didn’t join up for the trip to Nigeria as they had already made their flight arrangements to head back to their bases before linking up with the rest of the squad in Abuja. Chidozie Awaziem, Ahmed Musa, Sikiru.Olatunbosun, Stephen Odey, Ikechukwu Ezenwa, Kelechi Iheanacho and Alhassan Ibrahim were the players on the flight. However, Stephen Odey and Sikiru Olatunbosun immediately took a connecting flight to Lagos to link up with their NPFL side, Mountain of Fire and Miracles (MFM), for the all important Match Day 22 clash with in-form FC Ifeanyiubah. Chidozie Awaziem and Ahmed Musa reportedly left for Jos while Kelechi Iheanacho has gone to Owerri to sort out personal issues. All the invited players for the clash against South Africa have been told to report back to the Bolton White Hotel camp latest Monday morning. Nigeria will battle South Africa on June 10 at the Godswill Akpabio Stadium in Uyo in a 2019 Africa Cup of Nations qualifier.